The limited edition double LP and cassette version of the album adds four tracks, recorded live in Britain while Snowy White was still a member of the band. In 2013, a deluxe edition of the album was released. It consisted of two discs: disc one included the original release, and disc two contained live recordings from a 1981 Hammersmith Odeon show and a number of demos. Tracks 1–6 recorded live in 1981 at the Hammersmith Odeon, London. Tracks 7–15 are original album demo versions. A double single pack and 12" were also released, the other tracks being "Angel of Death" (live) / "Don't Believe a Word" (live). A 12" was also released, featuring the same two tracks and a poster. The B-side in the Netherlands was "Bad Habits". A 12" was also released featuring a remix of "The Sun Goes Down". ^ Prato, Greg. 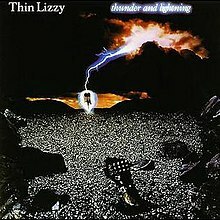 "Thin Lizzy – Thunder and Lightning review". AllMusic. Rovi Corporation. Retrieved 18 January 2015. ^ Popoff, Martin (1 November 2005). The Collector's Guide to Heavy Metal: Volume 2: The Eighties. Burlington, Ontario, Canada: Collector's Guide Publishing. p. 355. ISBN 978-1-894959-31-5. ^ Leim, Christof (May 2006). "Thin Lizzy – Thunder and Lightning" (in German). Metal Hammer. Retrieved 18 January 2015. ^ a b c d "Thin Lizzy Official Charts". Official Charts Company. Retrieved 15 February 2018. ^ "Thin Lizzy – Thunder and Lightning (Album)". Norwegiancharts.com. Media Control Charts. Retrieved 15 February 2018. ^ "Thin Lizzy – Thunder and Lightning (Album)". Swedishcharts.com. Media Control Charts. Retrieved 15 February 2018. ^ Byrne, Alan (2006). Thin Lizzy: Soldiers of Fortune. London, UK: SAF Publishing. p. 211. ISBN 978-0946719815. Retrieved 16 February 2018. ^ "Thin Lizzy – Thunder and Lightning". GfK Dutch Charts (in Dutch). Media Control Charts. Retrieved 15 February 2018. ^ "Top Albums/CDs - Volume 38, No. 15, June 11, 1983". Library and Archives Canada. 11 June 1983. Retrieved 15 February 2018. ^ a b "The Irish Cahrts: search for Thin Lizzy". Irish Recorded Music Association. Retrieved 15 February 2018. This page was last edited on 29 October 2018, at 20:03 (UTC).